Cast: Gong Yoo, Jung Yoo Mi, Ma Dong Suk, Choi Woo Sik and Kim Soo Ah. Seok Woo (Gong Yoo) is a divorcee, working as a fund manager. After getting divorced, he and his ex-wife share custody of their daughter Soo An (Kim Su An). Being a workaholic, Seok Woo usually leaves Soo An with his mother, and rarely has time for his daughter. When Soo An wants to go to Busan to celebrate her birthday at her mothers, Seok Woo has no other choice but go with her as he is afraid to let her take to train alone. At the same time, Seoul is havocked by mass riots, which the NEWS keep repeating. After arriving on the KTX a woman collapses in front of the train attendant, who while trying to help her gets attacked by the woman, by getting her throat slit. Soon havoc begins on the train as the train attendant, who was presumed dead, gets up and starts attacking other passengers. I do apologize of the summary looks bleak at the end, I tried not spoil anything. How on earth do I even explain this movie? I mean I had my fair share of Zombie movies AND TV Shows, but this one left me shocked and amazed. Though there are several moment I could complain about, I‘ve decided not to, because they don’t really ruin your overall experience of the movie. And honestly, I can pretend to know what I would do in those situations, but I bet I would be the first one to die anyways, so I am not going to act like a know-it-all. All actors involved are just perfect for each given role, though some annoyed me occasionally, I didn’t have time to dwell on it, since the pace is out of this world. So, I recommend this 100%, as this is one of the best Korean movies ever, AND one of the great zombie movies of all time. That’s how this movie left me. I can’t describe what this movie did to me. 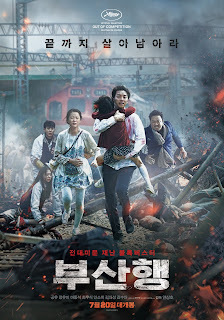 I’m not a big fan of zombie/ disaster movies, but this was more than that. I understand all the hype there was about it. The story, the acting (ALL of them!) and the details were so on point, I got shivers down my spine several times! Applause to all the zombie actors, damn they left me speechless. Gong Yoo definitely was the right pick, and that little girl playing his daughter needs an award right now!